and hurt quality. Three cornered Alfalfa Hoppers are really out in force please check before they hurt you. Attached you will find photos and descriptions of the major diseases encountered in your fields. Go to plantationseedupdate. for details on Ultra Late planting. Always follow label directions and wash all empties completely. Please see the attached PDF Document on Replanting Decisions for Soybeans. Seeding rate is one of the first steps toward a good yield. Soybeans have from 2200 seed per lb to 4500 seed per lb. Do not go by pounds per acre . 30” rows at 8 seed per foot will use 59 pounds per acre of a 2250 seed/lb soybean and only 41.4 pounds per acre of a 3600 seed/lb. soybean. You want about 145,000 seed per acre. For normal planting dates. Call if you plan to palnt HIGH yield irrigated soybeans this year. If you are planning to plant after June 30 please order your beans now and ask your dealer to advise your seedsman to place these late planted beans in cool storage. This will maximize your chance of getting high germing soybeans for your late planting needs. There are several group 5, 6, and 7 beans that have yielded very well planted late. Go to plantationseedupdate. for details on Ultra Late planting. *Some information obtained from 2015 Georgia Pest Control Handbook, Soybean Diagnostic Guide, and Pioneer. *** As always follow label and dispose of empties properly. Seeding rate is one of the first steps toward a good yield. Soybeans have from 2200 seed per lb to 4500 seed per lb. Do not go by pounds per acre. 30” rows at 8 seed per foot will use 59 pounds per acre of a 2250 seed/lb soybean and only 41.4 pounds per acre of a 3600 seed/lb. soybean. You want about 145,000 seed per acre for normal planting dates. LATE PLANTING: If you are planning to plant after June 30 please order your beans now and ask your dealer to advise your seedsman to place these late planted beans in cool storage. This will maximize your chance of getting high germing soybeans for your late planting needs. There are several group 5, 6, and 7 beans that have yielded very well planted late. May planted growers need to check their fields for insects NOW. Three cornered Alfalfa Hoppers are really out in force along with the Kudzu bug. See picture of damage by Three Cornered Alfalfa Hopper below. Often the stem will just break with wind or just walking through the field. Please put 40-50 lbs. of N out following corn for best yields; plant with a drill on 7 in centers. AGS 5911 LL is a very good late planted bean and has Liberty tolerance. *Some information obtained from 2014 Georgia Pest Control Handbook, Soybean Diagnostic Guide, and Dupont. Growers need to check their fields for insects NOW. Three cornered Alfalfa Hoppers are really out in full force along with the Kudzu bug. 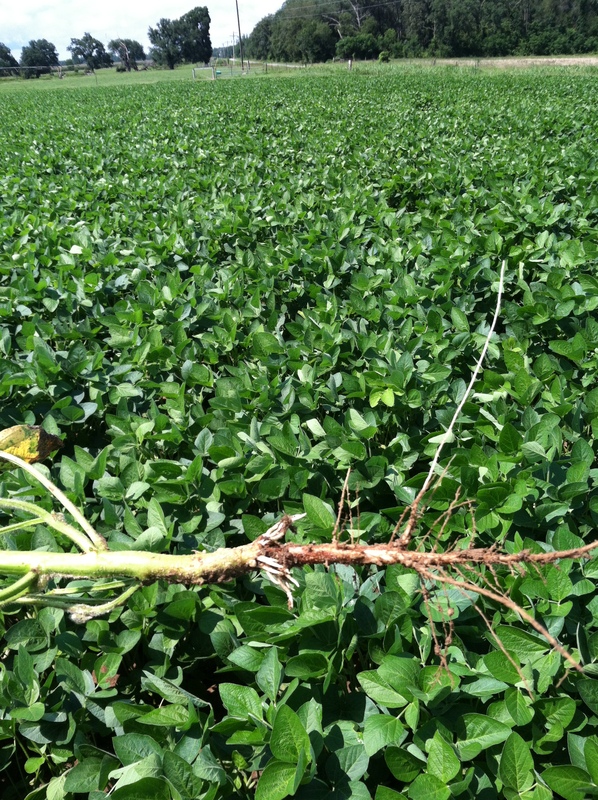 See picture of damage by Three Cornered Alfalfa Hopper and roots forming at damage site. Often the stem will just break with wind or just by walking through the field. AGS 5911 LL is a very good late planted bean and has Liberty tolerance. There are several group 5, 6, 7, and 8 group beans that have yielded very well planted late. You can read about Ultra Late Planting for details here on the blog. Seeding rate is one of the first steps toward a good yield. Soybeans have from 2200 seed per lb to 4500 seed per lb. Do not go by pounds per acre . 30” rows at 8 seed per foot will use 59 pounds per acre of a 2250 seed/lb soybean and only 41.4 pounds per acre of a 3600 seed/lb soybean. You want about 145,000 seed per acre for normal planting dates. LATE PLANTING If you are planning to plant after June 30 please order your beans now and ask your dealer to advise your seedsman to place these late planted beans in cool storage. This will maximize your chance of getting high germing soybeans for your late planting needs. There are several group 5, 6, and 7 group beans that have yielded very well planted late. Always follow label directions and wash all empties completely. *Some information obtained from 2014 Georgia Pest Control Handbook,Soybean Diagnostic Guide, and Dupont. I have had several calls about growers with no or very little pods after the plant started blooming. 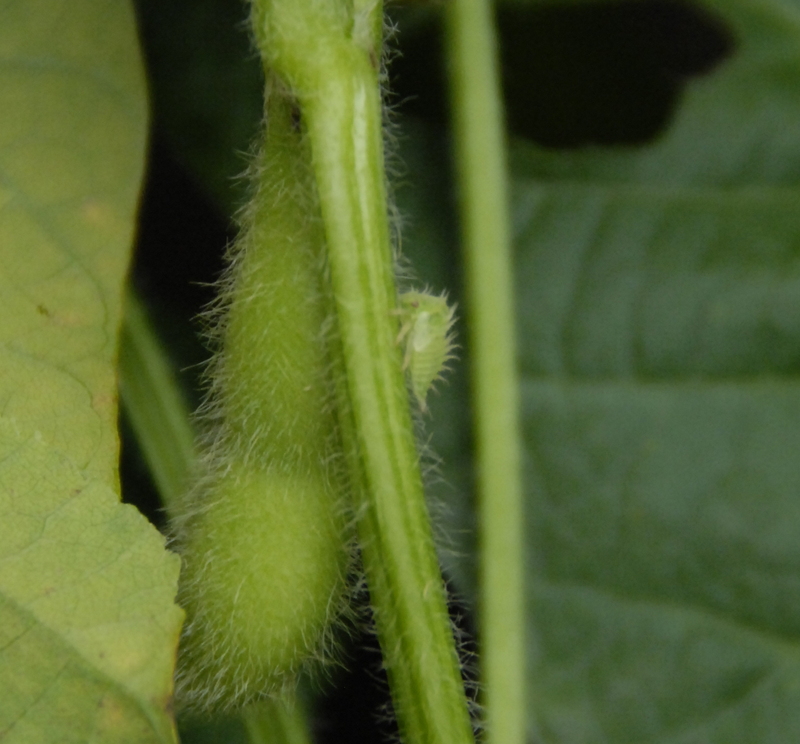 The soybean plant has a main bloom stem that will bloom out first, if no or few pods are set then an auxalary bloom node (at the base of each joint) will form blooms. Often during any type of adverse weather the pods and blooms will abort, this is normal. The soybean plant will continue to make blooms and try to set pods until the growing season is over or the plant/nutreint yield threshold is met. Please spray with a good fungicide. One spray per season is usually enough. A good fungicide has proven to give a yield increase of 6-8 bu/acre over non-treated soybeans in university test. 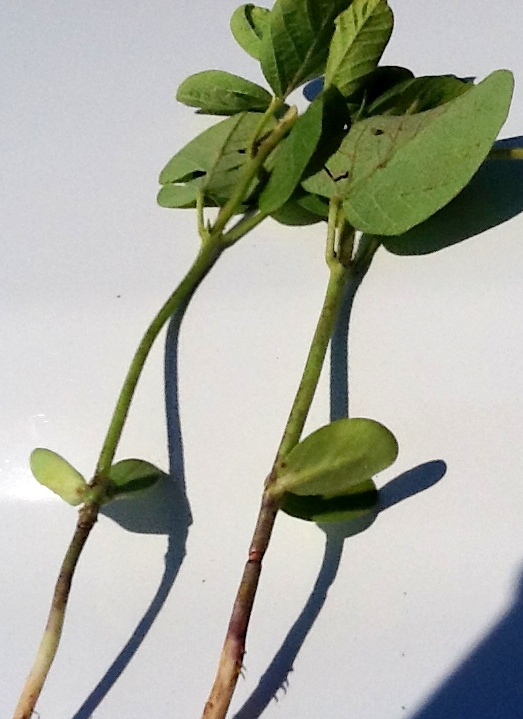 ( R-3 = Pods at least 3/16 inch on the fourth node from top of plant ) This usually occurs about 7 to 10 days after full bloom. You lose some effectiveness if you apply too early. To control velvetbean caterpillar and make loopers and stink bugs less of a pest add Dimlin. This year appears to be a very bad stink bug year. Look close at your soybean, cotton, and peanut fields especially if they are close to a harvested corn field because there has been several generations in your corn already. If you have stink bugs think about putting in some pesticide. 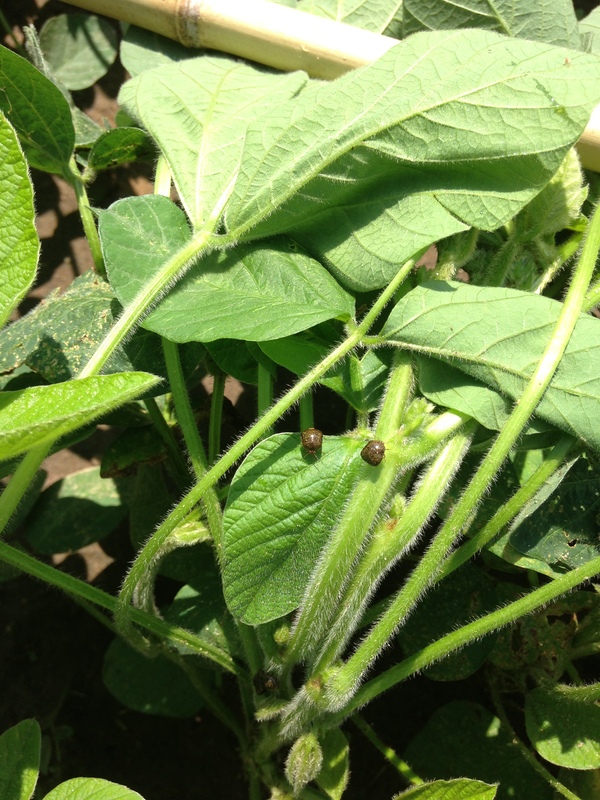 Watch for Kudzu bugs; I have found them in every field. Acephate (Orthene), Karate, Brigade, etc. **Pesticide information obtained from Georgia Pest Control Handbook @ http://www.ent.uga.edu/pmh/. Acephate (Orthene), Karate , Brigade , etc. **Pesticide information obtained from Georgia Pest Control Handbook at http://www.ent.uga.edu/pmh/. Growers need to check their fields for insects NOW. Three cornered alfalfa hoppers are really out in force along with the kudzu bug. 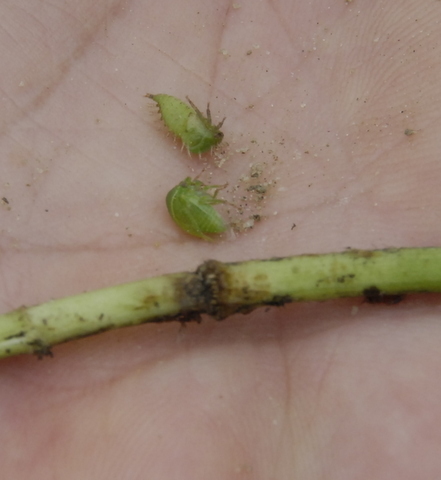 See picture below of damage by three cornered alfalfa hopper and roots forming at damage site. Often the stem will just break with wind or just walking through the field. 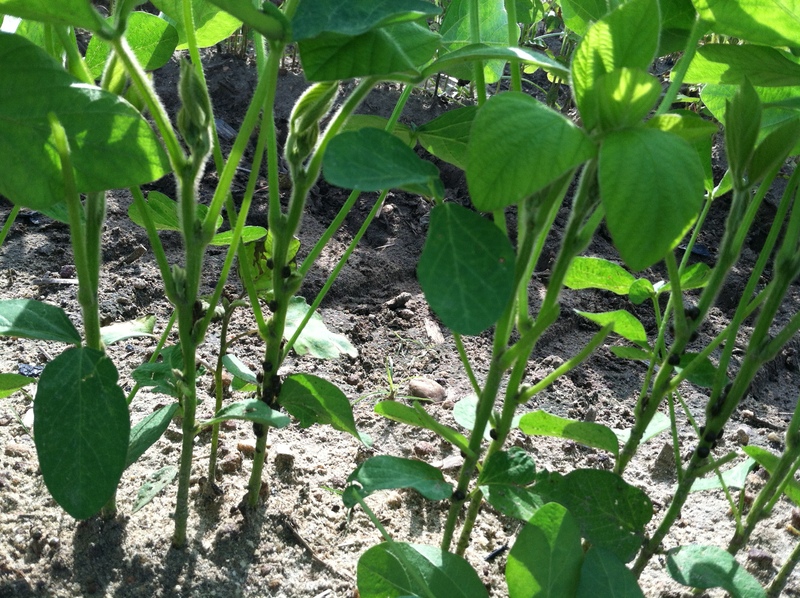 Late Planting – There are several group 5, 6, 7, and 8 group beans that have yielded very well planted late. As always follow label directions and wash all empties completely. *Some information obtained from 2013 Georgia Pest Control Handbook, Soybean Diagnostic Guide, and Dupont. **As always follow label and dispose of empties properly.